Malevolent Creation is one of those bands that has been on my radar frequently throughout the years, yet one that I never found the time to really listen to. 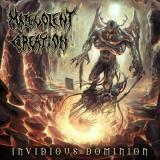 Fortunately I was able to grab up a copy of their latest release, Invidious Dominion, their eleventh studio album. It's impressive for any death metal band to come this far and continue for so long, especially with the number of lineup changes these guys have had. Now I don't know about other death metal fans, but for me to thoroughly enjoy this type of music, the band usually has to do something different than the usual chugging riffs, angry growls, and blasting drums. This album cannot necessarily be classified as such, however Malevolent Creation makes up for it by coming at you with intensity that few death metal bands can muster these days. The guitars are extremely heavy and distorted, yet slice right through anything that can be called an atmosphere. Furthermore the vocals of frontman Brett Hoffman are powerful and violent. In short if you like your metal to be fast and brutal, read on. After a short intro track United Hate starts the album off with strong, albeit generic, riffs and powerful drums. The vocals of Brett Hoffman soon come in, his aggressive growls punching through the wall of guitar and fitting nicely with the intensity of all the instruments. It gives you a pretty good idea of what to expect for the whole album as these guys do not let up for the entire duration, and that's what this album ultimately is: short, sweet and to the point. The point of course being to blast the listener with as much musical aggression as possible, yet still remaining in the realm of the listenable. The next few tracks don't do much of anything different than the first, though some guitar soloing is thrown in from time to time. Leadspitter catches my attention more than other tracks with its groovier opening riff. It's a repetitive track once again, but at under three and a half minutes it's not exactly wasting your time. Target Rich Environment continues this groovier transition, yet also creating an ominous feeling. The vocals of Hoffman are no less intense however, and the guitar work is stepped up somewhat with some quick pickwork from Gio Geraca and Phil Fasciana. Born Again Hard smashes you with yet another set of devastating riffs; however the drumming leaves something to be desired, not to mention it's not very strong in the mix. The title track rounds the album off with typical quick riffs interspersed with wailing guitar solos. The vocals of Hoffman are really what keep this track alive as they once again have the speed and intensity of a jackhammer. While not doing anything really different or original, I have a feeling that Malevolent Creation has learned what their fans expect by now, which is pure, intense death metal. It's fast, it's old school and if that's what you enjoy, then you'll probably really like this album. That being said, if death metal is not your thing don't expect this to be the album to win you over. Personally there's just not enough differentiation between the tracks for me to really be able to get into it, although I have to say that the good songs are really good and make me just want to charge headfirst into a mosh pit. I feel like these guys have the potential to offer a more complex musical experience than this, but at the same time this is a solid slab of death metal.